1. An easy one to start with: Are you as soul-numbingly sick and bored of the Tiger Woods coverage as I am? 2. Considering Jason Taylor's flirt with the Jets this off-season, how do you feel when an absolutely loathed opposing player joins your team? "He's my guy now", or "Still don't like him?" 3. How do you feel about colleges changing their team names like "Red Men" or "Fighting Sioux"? Do the names represent honorable qualities that the teams are attempting to emulate, or are they demeaning and offensive? Do the names Vikings, Padres, Celtics or Fighting Irish hit you as offensive as well? 4. Do you ever believe that Donovan McNabb will ever win a Super Bowl? If he doesn't, what will his legacy be? 5. 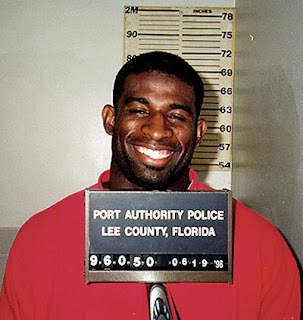 Using TheSmokingGun.com as a reference, which athlete gave the best mugshot ever? 2. I went through this when TO joined the Cowboys. I said then, just because he is in Dallas, it doesn't make him any less of an SOB. 3. I wish they would keep their names. People are too sensitive these days. The names aren't meant to be offensive. 4. I don't think so. His legacy to me will be that of Marino's, but not as good. 5. I liked Scottie Pippen's he was looking very stylish. Or the one with Mike Tyson basically sticking his tongue out. 3) team names do not insult me in any way, I think forcing a few to change is wrong. Its a name. 4) nope, good qb but even with lots of surrounding talent around him he choked/puked away his chances. 1. Absolutely...and I watched Mickelson win today. BTW...he took a lot of time off because his wife is battling cancer. A much better story in my opinion. 2. Jason Taylor is no longer an impact player. 3. Much ado about nothing. 4. McNabb will be a hall of famer like Marino.